Posted August 15th, 2018 by Jenna & filed under Music, PREVIEWS. Jesse Cook thinks that Banff is one of the most beautiful places in the world. He’s performed in Banff for decades but hasn’t performed in the Shaw Amphitheatre at the Banff Centre. “I’m always happy to be going to Banff especially in the summer. That’s the other thing, normally we tour more in the spring and the fall. So, the idea of being in Banff in the summer is a new experience,” Cook says. 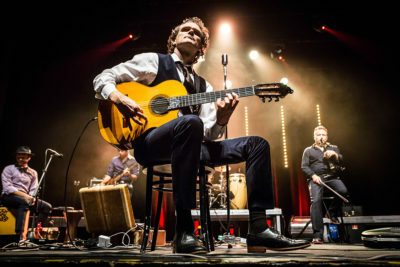 Therefore, Cook has traveled to Colombia and recorded with musicians there, he explored Arabic influences in Cairo for his album Nomad, he also experimented with Persian music. Lately, he’s been into looping and electronica, experimenting with urban sounds. His album One World was about mixing all the sound together. Beyond Borders has no rules. “I start to feel like there is a second meaning to Beyond Borders right now, where we’ve got Trump wanting to build a wall, you’ve got Britain and Brexit, and there is an extreme right party sort of on the rise in Germany, on and on it goes. It seems like I grew up in a time where we were tearing walls down. The Berlin wall came down. And now it seems like the ebb and flow of history we are back to building walls and separating, trying to scapegoat other people or accuse them of being enemies. Remarkably, Cook has never experienced writer’s block. But he has a secret. Thought there was a time when Cook was done with the guitar. But the orchestra director at his school wanted him to play for her orchestra, to show the kids what you could do if you practiced. Though Cook said he had quit, he didn’t play guitar anymore, she insisted. So he got up there and started playing a song off by memory but blanked half way through. He felt incredibly humiliated and for years the thought of performing brought on great anxiety. The incident got him to practice like crazy when he got back to playing when he was 15. He isn’t sure if the two are related, but must be connected. Catch Jesse Cook for an evening at the Banff Centre Shaw Amphitheatre this Saturday, August 18th. Tickets are still available online.